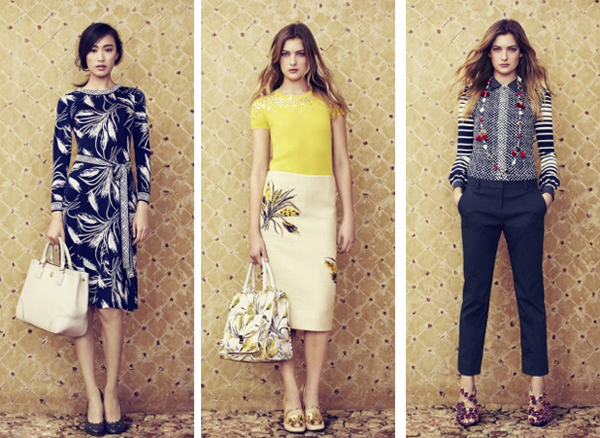 Once you take a look at this Spring/Summer 2013 lookbook by Tory Burch, you will immediately start dreaming about travelling to remote destination to demonstrate the garments from this range. This fashion brand has always introduced chic touches to its garments, which make it stand out among the abundance of fashion labels. As usual, in this Spring/Summer 2013 lookbook an accent is made on feminine lines instead of the seasonal trends that make the pieces out of time and vogue. Lensed by Norman Jean Roy in Tulum, this lookbook proves that Tory Burch is not going to break the brand’s longstanding approach to fashion. Beautiful Shu Pei, Tati Cotliar and Ophelie Rupp demonstrate a myriad of playful looks that ooze preppy allure with lightweight bohemian chic, which was weakened by the simple fabrics. Femininity is the key element of this collection that could be seen in everything starting from lovely skirts to the footwear range. Those of you who are looking for elegant garments that could be worn in a range of ways and suit different occasions should definitely draw attention to this lookbook. Besides whimsical printed dresses, this collection includes lovely tunics, beautiful skirts, cropped jackets, classy shirts and girly accessories, which will immediately boost your summer looks. Keep in mind that despite the fact that summer is all about effortless outfits, it wouldn’t hurt to make a bit of effort to look chic on a daily basis. 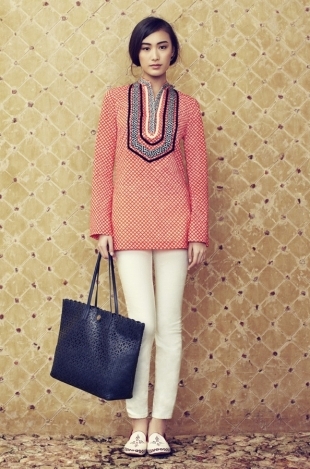 This Tory Burch Spring/Summer 2013 lookbook is a perfect example of smart combination of accessories and summery. Richly embellished shoes, printed and beach bags, lovely ballet flats and cute sunglasses – accessory alternatives from Tory Burch are the perfect styling elements of a spectacular look that will surely make everyone’s jaws drop.